Title: The Originary Hypothesis: A Minimal Proposal for Humanistic Inquiry Editor: Adam Katz Series: Critical Studies in the Humanities Imprint: The Davies Group, Publishers soft cover 382 pp. 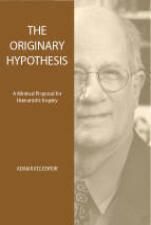 USD 28.00 ISBN 978-1888570366 September 2007 Eric Gans’ originary hypothesis, in contrast to virtually all contemporary thought in the Western academy, posits an origin to humanity, an origin that discloses to us our ethical limits and possibilities. This collection demonstrates the extraordinary power and range of the hypothesis in dealing with questions of aesthetics, morality, theoretical method, and historical and political thought. Eric Gans has hypothesized the origin of language and humanity in a scene of mimetic crisis, in which the first sign, a gesture of aborted appropriation, prevented the self-immolation of the newly human community. Gans has explored the consequences of the hypothesis in a series of books for a wide range of historical, philosophical, ethical and aesthetic questions. The Originary Hypothesis: A Minimal Proposal for Humanistic Inquiry brings together a series of new essays by collaborators of Gans and Gans himself that demonstrate the sophistication and applicability of Gans’ hypothesis as well as its ability to transcend formalistic and narrowly disciplinary approaches to the arts and social sciences. Contents Adam Katz, Introduction: The Consequences of the Hypothesis Eric Gans, On Firstness Raoul Eshelman, Originary Aesthetics and the End of Postmodernism Christopher S. Morrissey, Epigenetic Evolution of the Immaterial Intellect on the Originary Scene Adam Katz, The Question of Originary Method: The Generative Thought Experiment Eric Gans, Generative Anthropology and Bronx Romanticism Richard van Oort, Hamlet’s Theater of Resentment Peter Goldman, “The reforming of Reformation itself” Thomas F. Bertonneau, The Dispensations of Moira: Matter, Mind, and Culture from Thales of Miletus to Walter Pater Matthew Schneider, Intensity and Ambiguity in Romantic Poetics Chris Fleming and John O’Carroll, What is the Human? Eric Gans and the Structure of the Hypothesis Andrew Bartlett, Accusations of “Playing God” and the Anthropological Idea of God, Reviews “Eric Gans' originary hypothesis opens a new horizon for scholarship across the disciplines. The essays in the present collection are a timely summons to fuller engagement with the work of this profound, generous, surpassingly elegant thinker.” —Mark Vessey, Professor of English, Canada Research Chair in Literature / Christianity and Culture University of British Columbia “René Girard, the French-American theorist of violence, religion, and mimetic desire, is the first of post-war anthropological thinkers to advance an 'eventful' theory of human origins, in terms of the religious institution of sacrifice. But is has fallen to one of his most original students, Eric Gans, to reflect on the question of origins as such, in a way that bridges the gab between anthropology and philosophy. In so doing, he has produced a groundbreaking revision of Girard's anthropology. On the basis of the modern 'linguistic turn' and of European semiotics, Gans stresses the decisive role of language, while still doing justice to Girard's theories of sacrifice and 'mimetic desire.' The core of this creative correction is the notion that language is the definingly human power. The use of signs enables inchoate humans to defer conflict so as to create an enduring community on the basis of culture. This fine collection of essays introduces, explains, applies, and extends Gans' creative revision of Girard's theory of the 'sacrificial' origins of the human. In doing so, it reveals the rich potential and range of Gans' thought – its ability to illuminate politics, ethics, religion, history, culture, aesthetics, literature, and semiotics. It does so, moreover, on a philosophical plane. One of its most compelling aspects is its brilliant demolition of the 'victimary' thinking of post-structuralism, the tyranny of the 'oppressed' that has come to dominate the moral discourse of our world. It has much else to offer as well, in essays on Shakespeare, Aristotelian causality and 'originary hypothesis,' the history of philosophy, romanticism, Protestantism, and theology. Not everyone will be convinced by Gans' provocative ideas, but readers cannot fail to find these essays rewarding and illuminating. It is an excellent introduction to the 'originary thinking' of 'generative anthropology. '“ —Stephen L. Gardner, Associate Professor of Philosophy Department of Philosophy and Religion, The University of Tulsa Editor Adam Katz teaches writing at Quinnipiac University, is on the Editorial Board of Anthropoetics and writes on the originary hypothesis of Eric Gans, the Holocaust, composition and the innovative fiction of Ronald Sukenick. Eric Gans, A New Way of Thinking: Generative Thinking in Religion, Philosophy, Art locates the major areas of human representation, religion, philosophy, and art, in the context of the originary hypothesis. It explains the limits of philosophy and situates its project within rather than above that of universal morality. Finally, it elaborates a scenic theory of art and explains in its terms the difference between “popular” and “high” art, and the reasons why this distinction is increasingly less useful.